Zach Braff to Make B'way Debut in "Bullets"
Zach Braff will appear in the Susan Stroman-Woody Allen collaboration "Bullets Over Broadway" beginning in March. 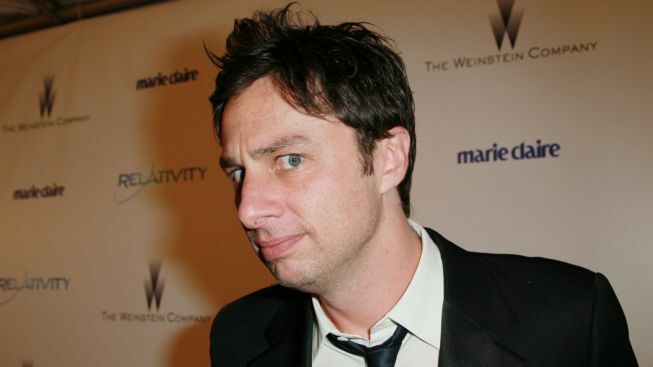 Former "Scrubs" star Zach Braff will make his Broadway debut next year in a musical adaptation of Woody Allen's "Bullets Over Broadway," producers said this week. "Bullets Over Broadway" will begin previews March 11 at the St. James Theatre, ahead of an April 10 opening. Five-time Tony winning director and choreographer Susan Stroman ("The Producers") will direct a cast of 29 that also includes Brooks Ashmanskas ("The Producers"), Vincent Pastore (Sal, on "The Sopranos") and Betsy Wolfe ("The Mystery of Edwin Drood"). Additional casting is still to be announced. "Bullets" is the story of an aspiring playwright (Braff) newly arrived on Broadway in 1920s New York who is forced to cast a mobster's no-talent girlfriend in his latest drama in order to see it produced. The Broadway production of 1994's "Bullets Over Broadway," with an adaptation by Allen, will feature existing music of the period.